Owned & run by Stella Viola di Campalto, of Roman & Piedmontese origin, the now 5ha hectare San Giuseppe wine estate – of which 0.5ha qualifies as Rosso – is located close to the south-eastern village of Castelnuovo dell’Abate in an idyllic, light-filled amphiteatro dominated by a massive sky & a breathtaking view that stretches almost as far as the Tyrrhenian sea! The parcels of vines are harvested separately in order to capture the maximum fruit quality and soil expression, handled by gravity & vinified in 100% oak, in large wooden troncoconici/vats, followed by affinamento in botte grande of approx. 17.5hL. All her fruit qualifies as Brunello di Montalcino, yet in 2003 she chose to declassify everything to Rosso di Montalcino her inaugural Brunello vintage was 2004. The Rosso di Montalcino is treated like a Brunello, while the Brunello is now a Riserva, released a year later. Production is naturally low – she prefers not to green harvest – & is dictated by the whim of the vintage & what nature has to offer. 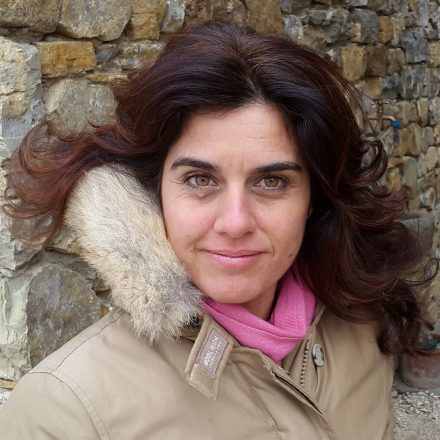 In 2011 she released two new wines from two diverse soils, & named them after her very different daughters: ‘Beatrice’ from the sandy soft soils of vigna Bassa & ‘Benedetta’ from the rockier, alberese soils of vigna Leccio. In her wines Stella seeks “la semplicita e la complessita insieme” (both simplicity & complexity). …retasted Nov’18: in a word ‘weightless’! Acqua di rosa, full of light, esile, gorgeous. 2015 Brunello di Montalcino Riserva – tasted June’17, from botte, to be bottled in 2022, pale red rose/blush, fragile red berried intensity, sunny, a core of zip, of electricity, cordial/sciropo concentration, yet delicate, I recall 2005 (when Stella chose not to make Brunello from her barely born vines), lovely fabric…simple but complex. 2013 Brunello di Montalcino Riserva – tight, scintillating red fruit, spezia, hay, spine-tingling, focused, sinew, such pace, crunchy, lift! A bright future. New : each year Stella makes a limited amount (c. 2k bts) of an IGT from a 0.29ha plot Vigna d’Olivo planted in 2000, that contains 4 exotic varieties Marcelain, Tannat, Arinarnoa (Merlot/PVerdot cross), a nameless one from Alto Adige & some Sangiovese. They remain true to the inimitable San Giuseppe expression, vinified fermented in tonneaux & barriques (not that you’d notice), & aged in cement. 2011 Brunello di Montalcino Riserva – Stella lost 60% of her crop due to the hot dry conditions, especially in August. Fortunately, her sandy silt & volcanic Basso vineyard held the water reserves well, & her alberese Leccio plot allowed for deep roots, so preserving the freshness in the fruit. Sultry, Maremma esque warmth, balsamic, essential oils, notes of burnt Mediterranean herbs, the silkiest of tannin structures, sumptuous fruit, strawberry density, complete & profondo! The sum of the parts!..aged in one 16HL & two 25HL botti grandi. Production c. 5k bts. Not available to collect pre Nov ’17. 2009 Brunello di Montalcino – sensational, sfumatura, decadent, warm fragola (straw-berry) patch fruit, captures the broad, full bodied character of 2009 vintage perfectly, with still primary summery, orange notes, open-hearted, it glides. Still young but irresistible even now!